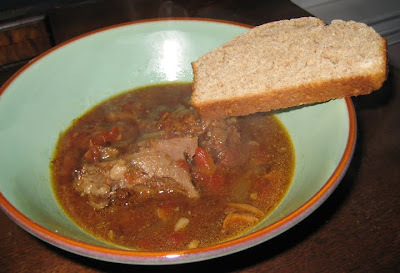 On Saturday, during the Snowpocalypse, I made a hearty lamb dish with Moroccan flavors, based on the Lamb with Prunes recipe in Claudia Roden's book, The Book of Jewish Food. 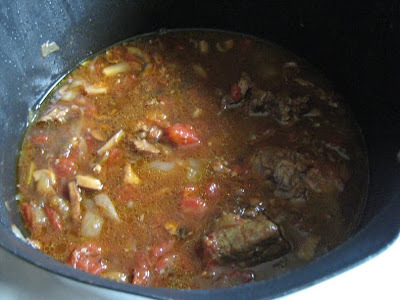 I call it "Faux-roccan" because neither a Jew nor a Muslim would do what I did - add pork stock. I didn't want to add plain water, and I had two quarts of lovely gelatinous pork stock left over from the pork shoulder I cooked on Friday. In addition to prunes, I added mushrooms, a can of diced tomatoes, and half a preserved lemon from a jar I picked up at Marshall's (you can find the most interesting gourmet items at Marshall's, et. al.) before the holidays. I let it cook for several hours until the meat was fall-apart tender. Then the carbon monoxide detector went off. While the stew was cooking, I baked a loaf of bread and a batch of brownies. Immediately I turned off the stove and opened several windows. Mr Minx checked the chimney, but it didn't seem blocked. The last time the CO detector went off was several Christmasses ago, when I had been baking cookies and prepping both Christmas Eve and Christmas Day dinners all at the same time. With a new puppy in the house, needless to say I didn't want to risk anything by cooking still more stuff, so plans for a bulghur pilaf were scrapped. 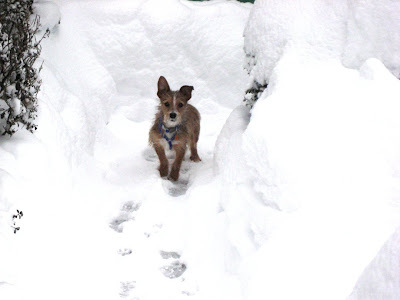 Instead, I took Milo outside for a romp in the snow, or more accurately, he raced up and down the narrow path Mr Minx had carved out in our back yard while I scraped up the last 1/2" or so of packed-down snow so it wouldn't ice over. And a beautiful thing happened - the sun came out, revealing patches of blue sky. Snowpocalypse was over! We went inside and celebrated with a bowl of lamby goodness, served with slices of beer bread. Would have liked that pilaf, but still - it was good.